The Metropolis 2000 tour brings Dream Theater to Düsseldorf, and with a tour that does not include Holland, I was not surprised seeing a lot of Dutch cars in the parking lot: of the three gigs in Germany, Düsseldorf is closest to Holland. On the November 1999 tour, the band did play in Holland, but since the latest album was not released yet when the band did their Scenes From A Memory Tour, the band decided not to do the whole album and do a "normal" set with only a couple of "scenes" from it. A tour baptised as Metropolis 2000 can only mean one thing, and that is the whole thing: all of Metropolis Part 2 - Scenes From A Memory. First of all, I must admit that I think this is not going to be a very good concert review. I never intended to do one in the first place, because that would mean I had to pay more attention to what was going on, rather than losing myself in the musical atmosphere. But I'll have a go anyway. After doing the interview with Mike Portnoy, we installed ourselves on the first row in the hall, which was still empty save a couple of other people with passes. We had to sit through Spock's Beard's opening set first, but I can think of a less enjoyable hour... Although it's obvious these guys are very good, their music doesn't really touch my soul. It did touch the souls of quite a number of the 7,000 other attendencees, so I guess the band themselves had a good time as well. Mike Portnoy joined on drums during one of their songs, with an Ace Frehley mask! I guess some of the audience knew about this beforehand, but I heard a lot of people really being amazed. I can't help but wondering why sound engineers have to turn the volume up that loud. I, and almost everyone around me, was glad to wear ear plugs, or this would have been one of my last gigs I could attend without a hearing aid. Today's PA's are of such a quality that this volume is completely unnecessary, so it can only mean sound engineers are deaf... It is even distorting the music! Because we came from backstage, we entered the venue through the stage door, and we had a look at the stage and the mixing desk, where a time schedule told us Dream Theater were due on stage at exactly 21:18h... And remarkably close to this time, the lights went out, and the intro of the new album was played back from tape. We had noticed the TV screens on the sides of the stage as well as two large flat screens hanging at the back of the stage. A clock ticking, and a bearded man telling you to relax... During the whole show, parts of the Metropolis Part 2 story that were put on film were shown, alternated with live shots by cameras that were stuck to mic stands, and animated graphics. Also the pictures that make up the image of Nicholas on the front of the booklet are shown on these screens. Because of this, the photographers in the area right before the stage, who were told they were allowed to take pictures during the first two songs, were lucky because the security guys were a bit confused... Also, they knew the rule "no flash lights" and probably this rule only: everyone with a camera who was in the audience, was allowed to take pictures, as long as they did not use the flash lights... Still I am very glad these security people were there, or I would have been spilled loads of beer on, lost my place with force, or squashed against the gate. I don't think it's necessary to repeat the titles of the different scenes - the whole album was played, in the order of the CD of course. I should, however, mention some additions to the musical story. During Regression, John Petrucci was sitting on a stool playing the guitar part, but James LaBrie stayed backstage. I don't know if his voice was from tape or live, since I could not see the man! The stage slowly became inhabited by the other instrumentalists, for the fireworks to begin. James was in very good shape tonight, better than he was in Brussels, as you can hear on the latest CD single release. I love his voice, and when I first heard him trying real hard to perform one of those "metal screams" on Awake, I knew his voice was simply not meant to do so. Also in this respect, Metropolis Part 2 is a great piece of music for James. Most passages are written in a way they bring out the best in him. Not the metal screams, but the high, melodic, and powerful lines. I only can't get used to the heavy breathing that seems to be popular nowadays during the quiet songs. Is it meant to be emotional? The only thing I can think of is that it's lack of technique, which is something that simply cannot relate to a singer like James. Jordan Rudess simply had to have a solo spot, in which he showed his marvellous craftmanship as a keyboard player. A weird solo he played, with modern samples creating a techno beat, and quite long actually. Could be a complete song if you ask me. The only thing is that this took place in the middle in Scene 7, if I remember correctly, between The Dance Of Eternity and One Last Time. The man is an amazing keyboard player, but the conductor should have placed his solo spot in one of the medleys, since it was too much of a break out of the magic created by the Metropolis - Part 2. 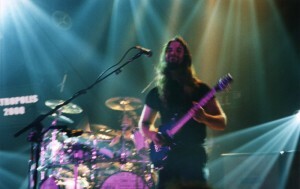 John Petrucci had several chances of adding some things to the music compared to the CD, but I think that between Scenes 4 and 5, he contributed a longer piece. 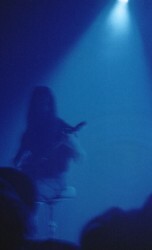 (Like I said, I didn't prepare to write this, or I would have paid more attention...) It's good Petrucci is in a band. I think that when playing solo, he would lose himself in techniques. I prefer his playing when he's staying with the melodies, which he fortunately did a lot. The bits of film showed scenes of which you hear the conversations on the CD, like the hypnotist at the beginning and towards the middle. The hypnotists, Nicholas, Victoria, the Miracle, and the Sleeper - they now have a face, which is a bit weird. It especially clarifies the scenes where Victoria and the Sleeper are shot by the Miracle. For example, I had some difficulties trying to find out where the knife came from, as was stated in the newspaper. And at the end, it's Nicholas getting into his car, driving home, pooring himself a drink, and putting on a 7" single with the march music. But then it's the hypnotist again, who now appears to be in Nicholas's house, telling Nicholas again to open his eyes... I think the story was meant to be open-ending, so you make out of this whatever you want. The whole thing was simple awesome. After being not so enthusiastic about their music from Awake to Falling Into Infinity, the band has got my full attention again. On CD it's wonderful, but experiencing this live was sheer magic. The encore consisted of two medleys. The band took a step back in time with these. The first is a medley of parts of A Change Of Seasons, songs from Falling Into Infinity and Awake, and a bit of Liquid Tension Experiment. Somewhere, I have read that this medley was dubbed Falling Into A Change Of Awake. I can't remember which parts were played, but at least the beginning of A Change Of Seasons was played, part of the 1996 version of Caught In A Web was included, and the ending was a mix of two songs, I think from Falling Into Infinity. I could not go further with this review without mentioned John Myung here. What a great musician that man is, filling in the bass spot during the LTE track that was also part of this medley. His fingers fly over the frets, following the undecipherable directions left by Tony Levin. Ah, those good ol' days... It has sentimental value for me, but I still am going out of my head when hearing even this short bit of Only A Matter Of Time. The two medleys confine themselves to two different eras in the band's history. It's great to see the contrast between those early melodic compositions and the more metal, experimental tracks. The way I see it, the latest album is both a step back to, and a step further on the path of melody-based composing. During these two medleys, the TV screens showed the CD covers as a basis for animations. And of course, the CD cover that was shown was of the album that contained the part that was played. With all the extra bits added to it, Metropolis - Part 2 lasted for about 90 minutes. The medleys were about 15 minutes each, so there you have it - two amazing hours! I know I haven't mentioned Mike Portnoy separately in this review, but I don't need to tell you how good a drummer he is. At times I think he's the conductor of the whole thing. No more drum solos, which is fine by me. I notice that man's contributions to the music without drum solos! A very long day for us, leaving at 13:30h, and getting back at 03:00h. But the experience was definitely worth it. This is a once in a lifetime happening - I don't think they will ever do the whole of this marvellous album again after this tour. I am extremely glad I had the sense to travel to Düsseldorf, and was able to attend a performance like this. Note: also read the interview with Mike Portnoy!